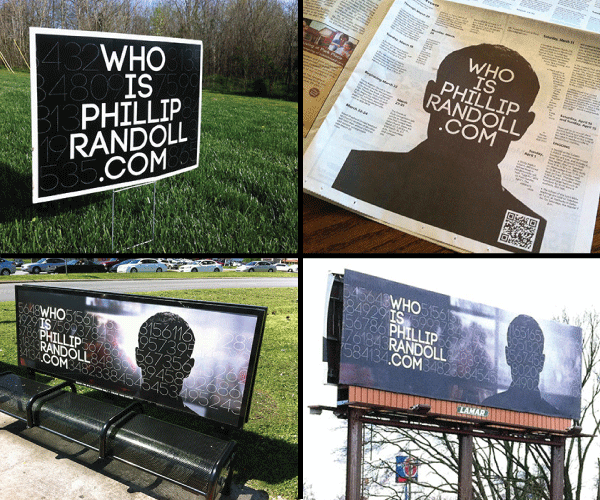 Easter at Long Hollow Baptist Church in Hendersonville, Tennessee, was all about answering one question: Who is Phillip Randoll? The church of 6,500 found success in the past using traditional marketing tactics like mailers and mini-websites. While they were known in their community, they wanted to do something new that stood out. The idea of using peoples love for mystery lead to the creation of Phillip Randoll – a fictional person who came to life online. To create a buzz, Long Hollow used all sorts of communications tools. Billboards, bus bench ads, yard signs, posters and newspaper ads plastered the city. Plus they created a website, blog and social media accounts for Phillip. Guess what? All of it cost half the money they usually spent on mailing postcards alone. Murrell says that is one lesson every church can learn from this project. “Huge money pits like mass mailers aren't always the best use of your communication dollars,” he says. As pieces of this campaign rolled out to the community, an alternate reality game began to reveal itself too. It took a lot of effort from church staff to create this fictional persona and it also took a lot of buy-in, too. Not only did they have to generate content; they had to believe in the idea. Beyond staff commitment, the congregation needed to believe in it as well. As one way of getting them involved, Long Hollow created a webpage with ways the congregation could engage in the campaign. It included images they could use on Facebook, e-cards they could send to friends and flyers they could print out to share. 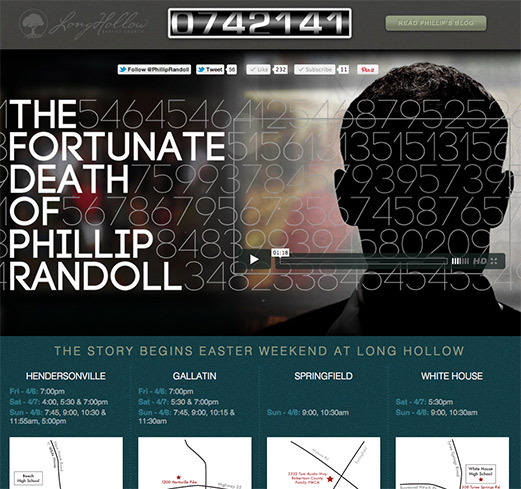 As the fictional Phillip Randoll came to life, online users started to see a mystery unfold. You followed him as he became sick and read along about spiritual conversations he was having with a friend. Readers learned more and more about him, and his love for puzzles, as little chunks of content and clues were revealed. It was an online game where a community of people could work together to solve a mystery. For their well thought-out, community engaging campaign of mystery, Long Hollow gets The Juicy for Runner-Up Communications Church of the Year in the large church category and a $1000 grant to help them with their upcoming communications projects. Wow, we’re REALLY honored guys; thanks so much for the recognition and the very generous grant. The Long Hollow Communication Team certainly appreciates both! Keep up the good work at ChurchJuice!